A 25-year-old man was arrested and several people were injured following a suspected DUI crash involving a school bus and an SUV in Gilroy, police said. The SUV, a Ford Expedition, was reported by witnesses to have been speeding in excess of 90 mph northbound on Monterey Road before the driver lost control, crossed opposing lanes of traffic and collided with a parked school bus near Rucker Avenue, according to the California Highway Patrol. When the Ford Expedition collided into the Gilroy Unified School Bus, which was preparing to offload students, the SUV overturned alongside the bus and trapped the driver and its other front passenger. Police said people in the area helped extricate the driver and passenger. The driver, identified as San Martin-resident Alberto Ceadano, was transported to San Jose Regional for minor to moderate injuries, police said, adding the woman passenger sustained minor injuries. 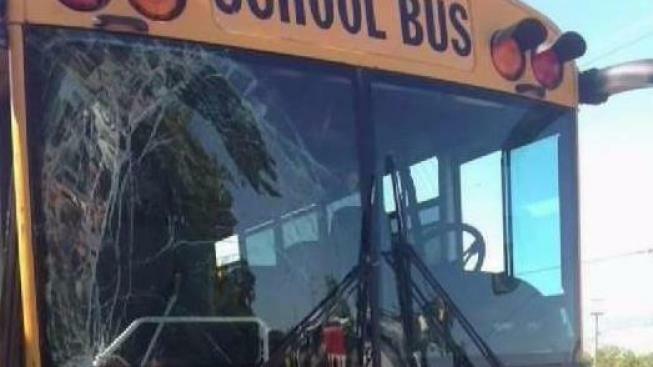 Police said the school bus was occupied by 47 passengers when the collision occurred. Two students sustained minor injuries. One of the students was transported to Valley Medical Center after complaining of shoulder and chest pain. Ceadano was arrested on suspicion of DUI and a warrant for a prior DUI, police said.